STUNNING, 1 OWNER, AUTO, VAUXHALL MOKKA1.6 TECH LINE CDTI 134 BHP. Finished in VELVET RED METALLIC with contrasting grey cloth trim. This is one of the most popular in the compact SUV market together with its premium package and SAT NAV, its a must have family suv. Features also include DAB radio, B/Tooth, Cruise Control, Park Sensors and much more. STUNNING £20 ROAD TAX, VAUXHALL MOKKA 1.6 CDTI SE ECOFLEX. Finished in BORACAY BLUE metallic, with contrasting 2 TONE HEATED FULL LEATHER trim. This very popular small SUV is one our best sellers in its class. Features include Sat Nav, Rear View Camera, Heated LEATHER, DAB, B/Tooth, Front and Rear Park Sensors, Alloys and with its new 1.6 engine ONLY £20 ROAD TAX. Dealer serviced at 9564 miles and on arrival at EMC at 21417 miles. MOT due on 8/2/2020. Featuring smooth curves and a rugged stance, the Vauxhall Mokka is an attractive small SUV that offers low running costs and a responsive range of engines. The elevated driving position provides an excellent view of the road ahead, while passengers are free to relax and settle in for the ride. 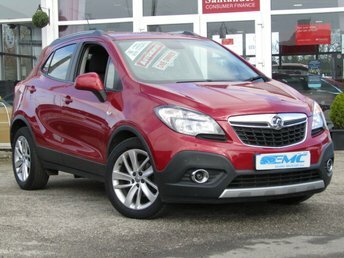 You'll find the very best deals on used Vauxhall Mokka cars for sale in Rotherham right here at Euro Motor Company. Take the opportunity to browse our current stock here on the website and don't hesitate to contact a member of the showroom team when you're ready to arrange a test drive. We'll go the extra mile to ensure you find the right used car to suit your needs.